Among the items on the ballot in Miami Beach, this year is Referendum 3. If approved, this referendum would complete the Miami Beach convention center with a privately-funded headquarter hotel. The project is guaranteed to generate at least $16 million in new revenue for the city, along with up to $225 million in projected revenue. This added revenue will go to funding solutions for some of our community’s greatest needs: local schools and education programs, stormwater and resiliency projects to combat our chronic problems with flooding and sea-level rise, as well as traffic reduction measures to improve the congestion on our roads. Because the connected hotel would be 100% privately-funded, all of these benefits come with zero dollars from taxpayer money or from public subsidies. Beyond just the revenue it will bring in for public projects, this referendum can also help us grow our economy. The convention center hotel is anticipated to provide hundreds of good-paying, local jobs, which can serve to stimulate and grow our middle-class. 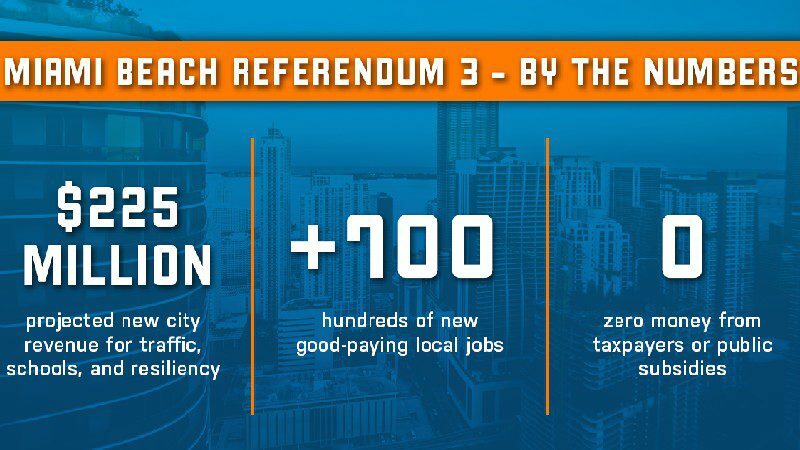 By approving Miami Beach Referendum 3, the connected hotel can make sure that we, the taxpayers, are enjoying the full benefit of the newly-renovated convention center. Experts estimate that we’ve already lost $160 million in revenue due to events and conferences choosing other cities and locations due to our lack of a connected headquarter hotel. Finally, this hotel will not only allow the convention center to keep existing events such as Art Basel and E-Merge Americas, and unlike past proposals, it will also help to preserve the historic Fillmore Theater. Due to all of these reasons, I plan on voting YES on Miami Beach Referendum 3. Early voting begins October 22 – November 4; November 6 is election day. If you want to learn more about this amendment and the benefits it will bring to our community, read more at www.yesonmbref3.com. I would agree. But one fatal flaw. The city only allowed 30 days for competing bids maingnit impossible to finding a better deal. The developers selection was fixed and corrupt.